The growing number and diversity of connected devices within the home and the desire for bandwidth-hungry online experiences, such as 4K video streaming and VR, are fueling exponential growth in the demand for faster home connectivity. Operators are continuously challenged to cost-eﬀectively deliver data rates that keep up with this exponential growth... in demand. In 2012, at the dawn of the DOCSIS* 3.0 era, Intel partnered with leading cable modem termination system (CMTS) vendors and proposed an evolution of DOCSIS* standards to allow operators to oﬀer higher-speed data rates. 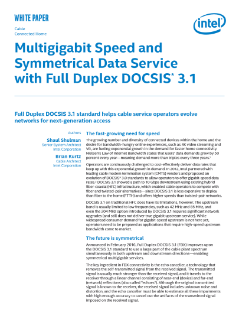 DOCSIS* 3.1 showed a path to 10 Gbps downstream using existing hybrid fiber-coaxial (HFC) infrastructure, which enabled cable operators to compete with fiber and twisted-pair alternatives. DOCSIS* 3.1 being less expensive to deploy than fiber to the home (FTTH) and oﬀering higher speeds than twisted-pair networks. DOCSIS* 3.1 on traditional HFC does have its limitations, however. The upstream band is usually limited to low frequencies, such as 42 MHz and 85 MHz, and even the 204 MHz option introduced by DOCSIS* 3.1 requires significant network upgrades (and still does not deliver true gigabit upstream service). While widespread consumer demand for gigabit-speed upstream is not here yet, operators need to be prepared as applications that require high-speed upstream bandwidth come to market. See the latest SoC which brings the highest performance, lowest power, and most flexible application platform to the market. Light Reading*'s Alan Breznick and Intel's Krithika Moorti discuss Intel® solutions for networks at Cable-Tec Expo.